MS Dhoni has finally spoke out something about Rahul.Currently, when everyone is worried about Rahul's form, captain Mahendra Singh Dhoni believes he's too big a player to worry about. "All players go through a phase," Dhoni said. 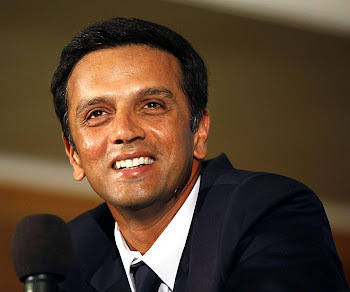 "But Dravid is a great player and has proved himself time and again for us. So we are not worried about his form." Although in Mohali that was not the case. After a bright innings of 39 in the first essay, Dhoni, the stand-in captain, decided to bring himself up the order with quick runs being the need of the hour. The situation wasn't all that different here, but India chose to stick with the same batting order in the second innings. Rahul could not get double figure on his name again. Dhoni said the good start India got in the second innings didn't call for a gamble to follow. "We got off to a good start and decided to send Dravid in," he said. "It's better to send someone in this situation who hasn't been in touch of late." That is something which may bring a ray of hope in Rahul's career.These words hold an importance from Rahul's point of view because he can get himself out of the pressure of being dropped.We will have to wait till England series (1st test match on 11 Dec.).